Since I had a leftover of clams and shrimps from last night’s meal (Spaghettini con Vongole) I had to come up with some recipe that will utilize them. 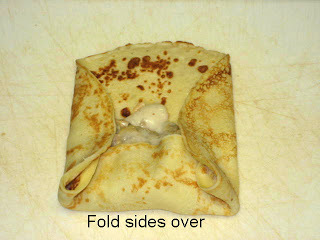 As I wrote in my Crêpe post, I came across my crêpe pans and idea for our dinner started to jell. 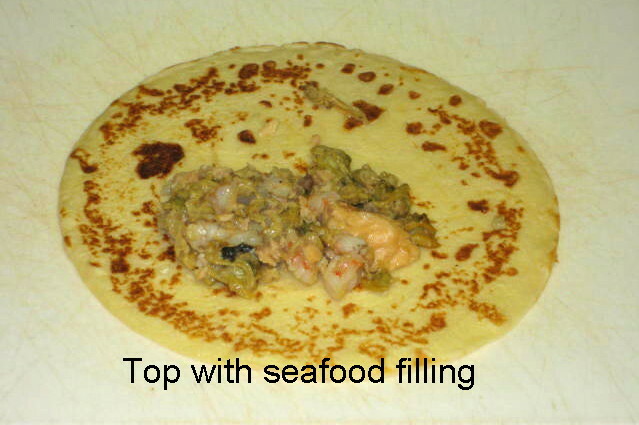 After I made the crêpes all I had to do was make the seafood filling and Mornay sauce. The filling was a cinch; I just added some pink salmon to clams and chopped shrimps and reheated it in their own juices. Then it was on to Mornay sauce which is basically just a Béchamel sauce with cheese. I used Fontina and Gruyere cheese. Also, when I melted the butter for Béchamel I sautéed chopped shallots till soft then added the flour and when light roux was made I poured in the heated milk and chicken stock (no clam juice or fish stock on hand) in 1:1 ratio. When the sauce thickened I whisked in grated cheese until smooth. Salt, white pepper and freshly grated nutmeg seasoned the Mornay sauce. Then it was to assembly and final prep. 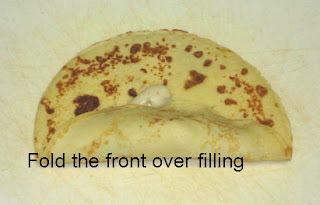 Assembly is very simple: put a tablespoon of filling in center front of crêpe, 2 tsp. of sauce on top and roll like taco. 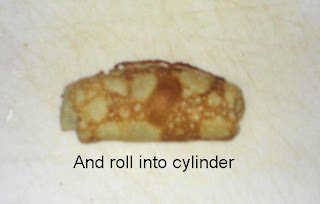 Place in buttered baking pan and when all crêpes are placed in pan, cover with aluminum foil and bake in 350°F for 15 – 20 minutes, basically just to reheat it. To serve, pour some sauce on preheated plate, place crêpes on top and then pour more sauce on top. 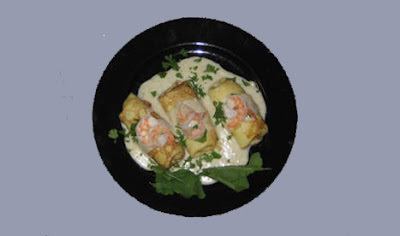 Garnish with shrimps sliced along spine in half, sprinkle chopped parsley and enjoy. It is (was!) so good! 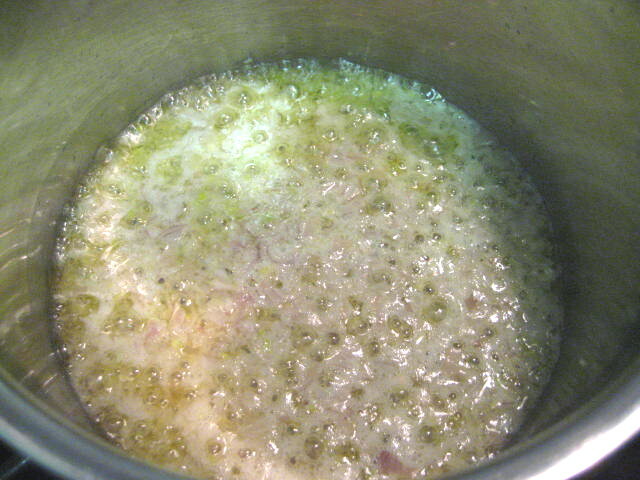 Start Béchamel with butter and shallots. 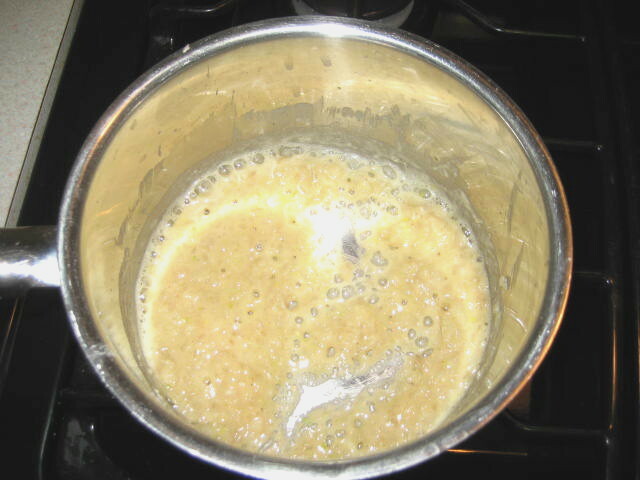 Add flour and make roux. Finish by adding milk and then cheese. Heat clams, pink salmon and shrimps. Now it is on to assembly. Place in buttered baking pan and when all crêpes are placed in pan, cover with aluminum foil and bake in 350°F for 15 – 20 minutes, basically just to reheat it. Notice the arugula garnish on left side of plate. I grew it in my cold frame till first big snowstorm first week of December when it was harvested and stored, unwashed, in Ziploc bag in an unheated garage that had a constant temperature of about 5 °C. Four weeks and it is still as fresh as when it was picked! Incredible green.